After teasing us with the momentous cover spread just yesterday, Empire has debuted a trio of stunning images of Batman V Superman: Dawn of Justice, highlighting the titular pairing along with Jesse Eisenberg’s twisted, power-mongering puppet master, Lex Luthor. 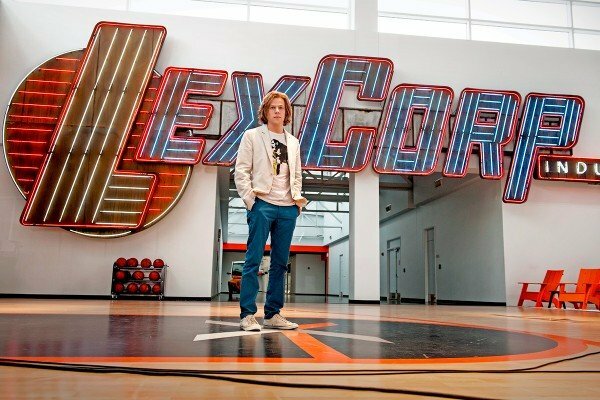 While the images of Bats and Supes will be familiar to those who have kept up to speed with Warner’s marketing machine, the still of Eisenberg’s leering antagonist is brand new. As the unpredictable CEO of a massive conglomerate, Luthor’s financial might is matched only by his brainpower, and we’ll begin to see his masterplan unfold when he divides the Man of Steel and The Caped Crusader in Zack Snyder’s musclebound epic. What’s interesting about Kal-El’s money shot is that it appears to be taken from within a decimated Wayne Manor, as the towering alien presumably searches for something to use against Affleck’s Batman. In the other corner, The World’s Greatest Detective can be seen wielding the armored suit, designed to target Superman in his infamous Achilles’ Heel with a potent dose of Kryptonite. In addition to the stills, Warner Bros. has confirmed that, as many had already suspected, Tao Okamoto will play the role of Luthor’s right-hand woman, Mercy Graces. Along with Henry Cavill, Ben Affleck and Jesse Eisenberg, Dawn of Justice will also bring together Amy Adams, Laurence Fishburne, Jeremy Irons, Holly Hunter, and Scoot McNairy. Batman V Superman: Dawn of Justice will set the DCverse into motion when it blasts into theaters on March 25, 2016.